Cat costumes are a classic girl staple, of course. It's fun to transform into our feline friends at least once a year because cats have a certain amount of sass and ladies know they love to be as sassy as possible from time to time. (Am I right, ladies?) If you're looking to take your annual cat costume to the next level this year, then we can definitely help you out. 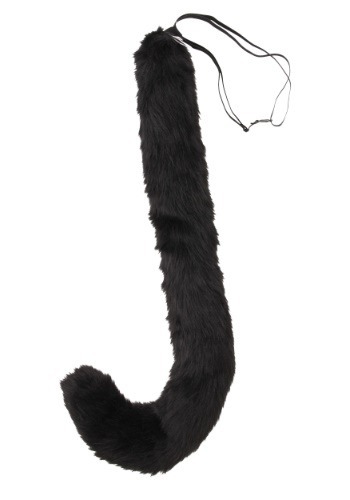 Now you can look exactly like your precious pet kitty by sporting a long, luscious, all-black tail. Others wearing basic kitty costumes will be envious of how purrfect you look while sporting our deluxe oversized kitty tail. This convenient accessory is completely poseable so you can twist and mold it into the shape that you want. You’ll be the cat’s meow while sporting our deluxe oversized kitty tail because it easily attaches to you via a stretchy elastic band. Fasten it around your waist and you'll be ready to prowl around the neighborhood and show off your alley cat strut. This black oversized tail works with whatever color cat costume that you choose. Pick up a pair of ears and some paw mitts that are sold separately and you'll have the complete kitty look.